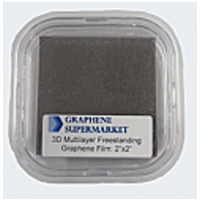 wielowarstwowy 3D - 2"x 2"
The 3D Graphene Foam is made via chemical vapor deposition (CVD) processing. In course of CVD fabrication of graphene hydrogen and methane gases are introduced into a furnace that heats to 1000° Celsius. In the furnace is a nickel or copper film which captures a mono or multi-layer or graphene as the furnace is heated and the methane decomposes. 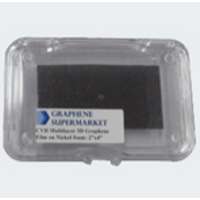 To create CVD Graphene Foam, instead of using a thin sheet of nickel to capture graphene, nickel or copper foam is used. The metal foam captures graphene in a similar foam structure. The metal skeleton is then etched away and left is a visible, porous 3D graphene foam structure. This structure has a high surface area, which opens several exciting applications for Graphene Foam while maintaining most of two-dimensional graphene’s properties1. CVD processing of Graphene Foam opens a cost-effective route for engineering a new class of ultra-light, highly conductive graphene-based materials with exceptional mechanical strength, flexibility, and elasticity. One of the likely applications of Graphene Foam is in chemical sensing. Graphene sensors which have been made with Graphene Foam were found to be about ten-times more sensitive than ones currently on the market, detecting 20 parts-per-million of nitrogen dioxide. Further, the graphene sensors were able to detect gases at room temperature, while many commercial sensors today require high temperatures to work properly. The porous graphene is not only more effective than current commercial sensors it also can easily be reused. In order to “empty” the graphene of trapped gas molecules, all the graphene needs is an electric shock. 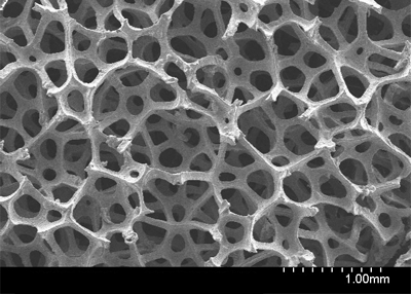 Graphene Foam graphene may also be used in energy storage, such as supercapacitors and batteries. The structure of the graphene foam opens the potential to store massive amounts of energy for example, hydrogen. The Graphene Foam has a high surface area thanks to its porous nature, giving it a high electrochemical capacitance. The electrical and structural properties of CVD grown Graphene Foam are superior when compared to the properties of its rivals, chemically derived reduced graphene oxide and few-layered graphene nanoplatelets. Both rivals suffer from a high concentration of defects as well as poor interflake mechanical contact. 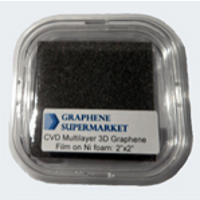 This is because, unlike CVD Graphene Foam, they require many separate sheets of graphene to connect with one another whereas CVD processing creates the entire Graphene Foam at the same time.